VARIETY PACK: Treat your taste buds, fuel your mental focus, and keep your workouts productive and effective with the unique blend of electrolytes and hydrating agents found in each of our Phocus flavors - containing 4 Natural, 2 Blood Orange, 2 Grapefruit, 2 Cucumber, 2 Yuzu Lime. CLEAR PHOCUS: Each serving is infused with the neuro-enhancing amino acid L-Theanine, the active ingredient in green tea. This subtle enhancement ensures a calm, smooth caffeine release, preventing jitters and energy crashes. 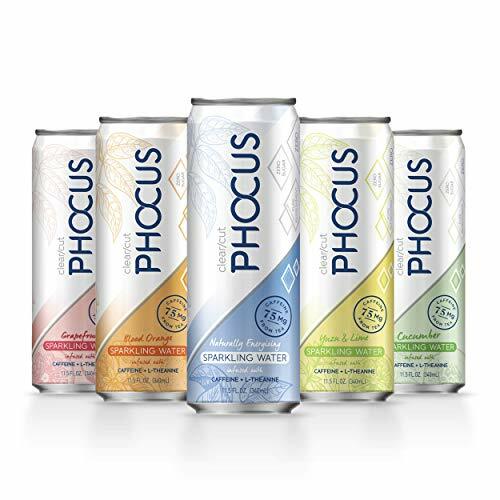 PHOCUS ON THE GOOD: Phocus is a great-tasting, natural, energizing refreshment that is kosher, vegan, non-dairy, non-GMO, and gluten-free.